In Wisconsin, A Decade-Old Police Shooting Leads To New Law Race is at the forefront of the current debate over police use of deadly force. But one shooting brought attention to another factor at play when police shoot civilians and receive no punishment. Michael Bell Sr. (center) and his family stand near one of the billboards they bought in a campaign to bring awareness to internal police investigations. Bell's son was shot and killed by police in Kenosha, Wis.
Race is at the forefront of the current debate over the police use of deadly force. But one shooting in Wisconsin highlights another factor at play when police shoot civilians — the lack of outside investigation. And the decade-old death has led to real reform in the state. Ten years ago, 21-year-old Michael Bell Jr. pulled up to the house where he lived with his mom and sister in Kenosha, Wis., about an hour south of Milwaukee. A police officer who, according to a police report chose to follow Bell after observing his driving, arrived shortly after. A subsequent toxicology report showed that Bell had been drinking that night. It wasn't until later that we realized just how little of an investigation had been done. 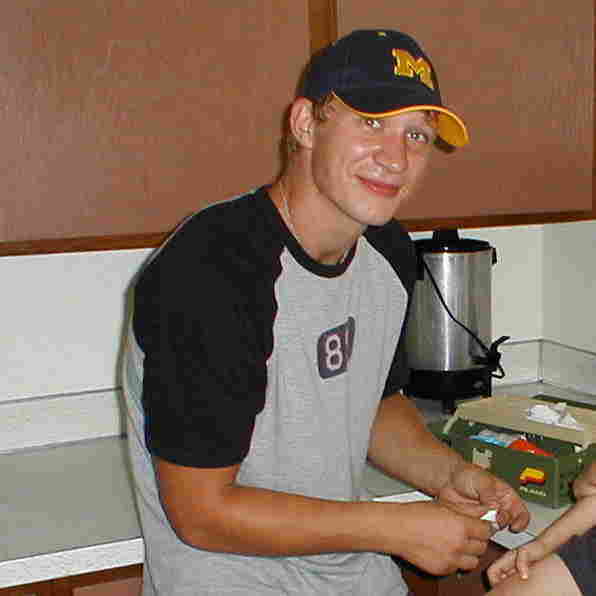 An unarmed Michael Bell Jr. was shot and killed by Kenosha police officers in front of his parents' home in 2004. The actions of the officers involved were deemed justified after an internal investigation. As a retired lieutenant colonel in the U.S. Air Force, Michael Bell Sr. says he's been a part of mishap investigations before. He was expecting a long, drawn-out investigation into his own son's death — not a decision made by the same police department in just a couple of days. "I was just completely appalled," Bell says. He says he knew the police had not even talked to the witnesses or gotten the report back from the crime lab. "So to clear themselves in 48 hours, I was just completely flabbergasted." Bell says the family was in shock as they went through the difficult grieving process and were trying to make funeral arrangements, so he cautioned patience. But after lab reports finally came back, Michael Bell Jr.'s DNA and fingerprints were not found on the officer's gun. So in 2010, Bell launched his own investigation. "I finally made a decision that we're never going to get to the truth of the matter, unless we bring in our own personal investigators," he says. "So we hired an investigative consultant who teamed up with a retired Kenosha police detective." Gina Barton, of the Milwaukee Journal Sentinel, says that one of the experts hired by Bell came up with a theory that the gun had probably gotten caught on the rear-view mirror of the car near the scuffle. That mirror was in fact broken after the incident. "The officer probably thought he had grabbed the gun, because why would an officer say that?" Barton says. "But as far as I can tell, it was a miscommunication and a misunderstanding that lead to [Bell's] death." "The investigation showed that the actions of the officers were reasonable, appropriate and well within Kenosha Police Department policy, procedure, and training. I am fully confident that the officer's actions complied with the Kenosha Police Department's use of force guidelines." Barton says that Wisconsin has had many officer-involved shootings and custody deaths. One of the problems that a lot of people in the community have with these situations is that the officer's own department will investigate the use of force. The investigation showed that the actions of the officers were reasonable, appropriate and well within Kenosha Police Department policy, procedure, and training. "So if you know this officer, if you've worked with him before, can you really be objective in terms of evaluating that shooting? And is it really proper for the police to be policing themselves?" Barton says. The Bell family ended up filing a civil suit for wrongful death. Six years later, they received a $1.75 million settlement. But there was no admission of wrongdoing, and the police maintained that Michael Bell Jr. caused his own death. The family used the settlement money to fund a grassroots campaign. They took out ads in the New York Times, in USA Today and on radio and created TV commercials. The campaigning went on for years, but Barton says the message really gained momentum after another police incident in 2011, where a 22-year-old man died in the backseat of a police car. The medical examiner ruled the death a homicide. 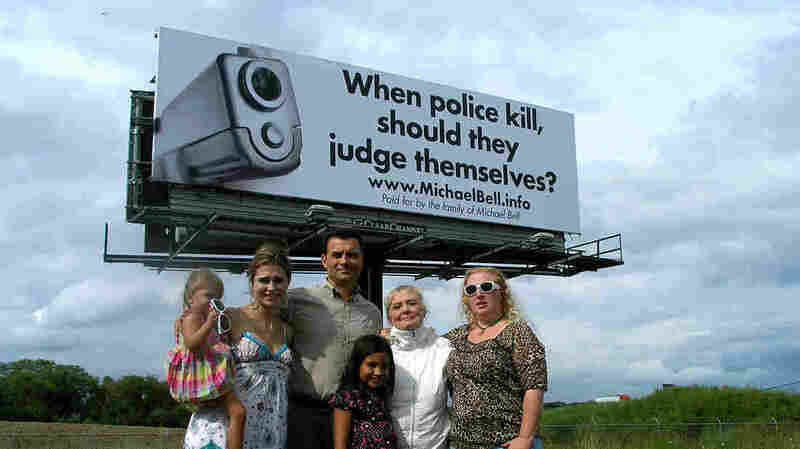 Bell bought every available billboard in Milwaukee with slogans like: "When Police Kill, Should They Judge Themselves?" "After we created enough ruckus, the unions ended up sitting down with us and talking with us," Bell says. They told him that if he wanted to take the billboards down, they would work with him in crafting some the legislation he sought. "I had formulated in my mind what really needed to occur here to make this process better," he says. The law they put forth would make Wisconsin the first state in the nation to mandate, on the legislative level, that if an officer was involved with a loss of life, that outside investigators must come in and collect the data and investigate that shooting. If you know this officer, if you've worked with him before, can you really be objective in terms of evaluating that shooting? And is it really proper for the police to be policing themselves? This past April, Wisconsin Gov. Scott Walker passed the bill into law. Gina Barton says Bell was able to work with politicians on both sides of the aisle, and sold the bill as benefiting both the family members of whoever died as well as the officers involved. "Because if you actually did do everything right, why wouldn't you want a transparent investigation that clears you and that shows everybody why you did the right thing?" she says. Bell recognizes that their accomplishment with the bill happened with the help of the police. Five police units were even present when Gov. Walker signed the bill. "I'm not against law enforcement, even though a law officer killed my son," Bell says. "And I do recognize that a number of police officers risk their life to protect people. In fact, police officers need to be part of the solution." In the audio of this story, as in a previous Web version, we incorrectly say Bell was pulled over for suspicion of drunken driving and running a stop sign.